Last Week in Review: The cha-ching didn’t register at retailers in May. Housing Starts disappointed. Inflation remained tame. Forecast for the Week: Did home sales heat up in May? Find out. View: Cut your workload when you cut and paste your most common email responses. “Don’t bring me down.” Electric Light Orchestra. Despite gains in April, consumers slowed down their purchases in May. Retail Sales in May saw the biggest decline since January 2016, the Commerce Department reported. 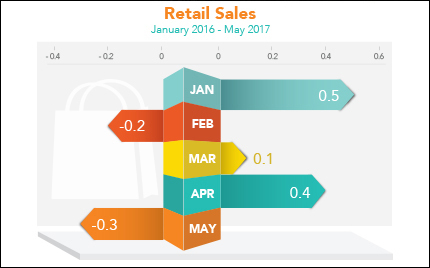 Retail Sales were down 0.3 percent from April, in contrast to the 0.1 percent increase expected. Sales for motor vehicles and discretionary spending both fell. But, on a positive note, Retail Sales are up nearly 4 percent from a year ago. Housing Starts fell 5.5 percent in May from April to an annual rate of 1.092 million units, below expectations per the Commerce Department. It was the lowest rate since September 2016 and the third straight month of declines. Single-family starts, which account for the biggest share of the residential housing market, fell to the lowest level in eight months. Builders cited a lack of skilled workers and a rise in building materials for the decline. Housing Starts are also down 2.4 percent from May 2016. Building Permits, a sign of future construction, fell 5 percent from April to May. Consumer inflation remained tame in May. Year over year, the Consumer Price Index (CPI) fell to 1.9 percent after hitting 2.7 percent four months ago. Wholesale inflation as measured by the Producer Price Index was unchanged in May due to lower energy costs. The Federal Reserve raised its benchmark Fed Funds Rate by a quarter percent after its June meeting, as forecasted, bringing the new target range to between 1.0 and 1.25 percent. This is the rate at which banks lend money to each other overnight and it does not directly impact long-term rates like home loan rates. Despite recent volatility in the Bond market, home loan rates remain near historic lows. If you or someone you know is in the market for a home, please contact me today. I’d be happy to answer any questions about home loans. April Existing and New Home Sales data disappointed. We’ll find out if May’s data heated up. Existing Home Sales will be shared on Wednesday followed by New Home Sales on Friday. As you can see in the chart below, the Mortgage Bond market saw volatility this past week. Home loan rates remain near historic lows. One of the quickest ways to streamline your productivity is to automate as many repetitive tasks as possible. And one of the easiest things to automate is found right in your email inbox.Chances are you send a lot of emails that are similar. Rather than retype the same messages over and over, craft a simple canned response for each repetitive communication type. Then, just cut and paste the response or input your saved canned message, lightly editing to suit specific details. As promised, please find attached [short description of document]. Sending attachments is one of the most common repetitive emails in business, but give some thought to the other common email communications that you could can as well. From sharing instructions for customer procedures, to requesting status updates or confirmations, to product descriptions, to letters of introduction, the timesaving possibilities are endless. Take a look at your inbox and see how many canned emails you can create to help you save time and energy!